Unfortunately some rooms in Brasenose and the annexes have better wifi coverage than others. If you are struggling with your wifi connection, we can provide a PWAP (Personal Wireless Access Point) for you which will work in any room you stay on college premises. This plugs into your wall and then acts as your own wifi router. This is a free service providing the Access Point is returned at the end of your stay at Brasenose (For students £20 is charged to batels if not returned in working condition). Please note that due to the potential for network disruption it is absolutely prohibited to connect any router or wireless access point to the network that was not issued by the college. If you would like one please come and see us in the IT office or email computer.office@bnc.ox.ac.uk. 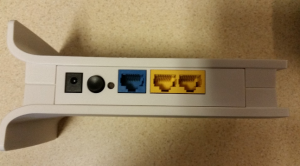 Connect the Ethernet cable between the network socket on the wall in your room and the BLUE port on the back of the router. If this is the first time you are connecting to the network through your router, you will be directed to the brasenose registration page where you will have to login with your Remote Access SSO Login (RASSO) click here for more information on username types. On completing this, you should have internet access. If not, restart the router. If you are already registered to the BNC network, you will have to just connect to the wireless network and start browsing straight away! If you're having problems connecting to your router, see our troubleshooting guide. If you are still having problems, please contact the ICT office.